Selecting the perfect bed for your space and your lifestyle can be tough. It’s a very personal decision, but there are some things to keep in mind when choosing the perfect bed. When hand selecting beds to carry on demiryan.com, it was important to me to find something for everyone. Whether you’re drawn to an upholstered, tufted headboard or think an intricately carved hardwood bed is perfect for you, we’ll help you find just the right one. Bed styles and prices can vary greatly. We currently carry nearly 40 types of beds from 10 different vendors, which gives you plenty to choose from. Prices ranging from $250 to $9,500. I meant it when I said, “We have something for everyone!” From traditional to contemporary, raffia to wood, linen to velvet, if you can imagine it, we can help you find it. Since a bed is generally the largest piece of furniture in a room, it is important that it fits your personality and needs. If you have pets, a white linen upholstered bed is probably not your safest purchase. A wooden bed may be a better option. It is more sturdy and can be wiped clean with a damp cloth. Durable fabrics, such as indoor/outdoor fabrics, or materials that clean easily, such as cotton, are great alternatives for upholstered beds and headboards. A luxurious master bedroom calls for an elegant bed. Maybe something in velvet with nailhead details or button-tufting? Each bed we carry is unique, and I love every one, but some stand out for me as exceptional pieces. 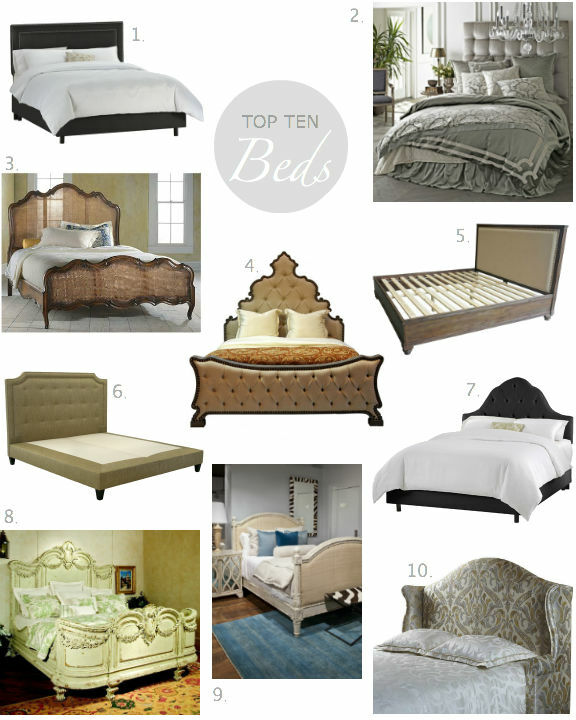 My favorite top 10 beds from demiryan.com are listed below along with the details that make each one special. If you need additional information on any of the beds we carry, call us or send an email. We have designers on staff who are familiar with each of our manufacturers and are ready to help you make your final decision. 1. Skyline Nail Button Border Bed in Premier – Available in 6 colors, the Nail Button Border Bed in Premier fabric is a top seller. Starting at only $535, it is beautiful and affordable. The headboard, footboard, and side rails are fully upholstered. I love the nailhead detail around the headboard! 2. Lili Alessandra Lynn Headboard in Silver Velvet – This outstanding button-tufted headboard is wrapped in classic sliver velvet and handmade artistry that adds a tailored look to the head of your bed. It attaches to the bed frame and includes all the necessary hardware. 3. Highland House Marigny King Cane Bed – Made of a combination of yellow poplar, okoume, and cherry hard woods, the Marigny King Cane Bed is sturdy in build yet light in appearance. It is available in the Loire Valley finish, as shown. Made in Hickory, North Carolina. 4. Peninsula Lisbon Bed – Made with hungarian hemp fabric and finished in dark grey frame, the Lisbon Bed by Peninsula takes front and center. The king size stretches to a tall 90″ high! The intricate woodwork and button-tufting add dimension and personality to any bedroom. 5. Zuo Modern The City Bed – Inspired by late 18th-century French furnishings, this bed captures the linearity, rectangular shapes and painted finishes associated with that period. The City bed is made of solid Elmwood with a linen and nailhead backboard. Available in Queen or King. 6. Best Slip Cover Bliss Platform Bed – Constructed by hand in Los Angeles using kiln-dried Alder wood, the Bliss Platform Bed is available is over 20 fabrics and leathers from bright patterns on linen to green leather with pebbling. My favorite part about the manufacturer of this bed, Best Slip Cover, is it is a family-owned and operated business with more than 50 years of experience in the furniture industry! 7. Skyline Arch Tufted Bed in Shantung – Another favorite from Skyline! I love the beds from this manufacturer because they are inexpensive yet built to last. The Arch Tufted Bed in Shantung fabric starts at only $408 and is available in 4 colors. 8. Habersham Florentina King Bed with Garland – I love the touch of classic European style this bed brings into a bedroom. Capturing architectural elements once found in 18th Century French estates, this bed’s design offers a rich frame for your finest linens and bedding. 9. Oly Studio Helena Bed – The Helena bed captures the provincial charm of a French country cottage in the bedroom. The hand-carved, hardwood frame is complemented by nailhead trim and upholstered head and footboards. Shown with raffia upholstery, the Helena Bed is available in several finish, fabric and size options. 10. Candice Olsen For Highland House Diva Upholstered Headboard – The Diva headboard offers true elegance for your room. It has a wing-style headboard with simple rolled arms. The wing chair style provides a restful place for you to lay your head. I love the fabric on this piece: a beautiful array of blues and greens.